Hey y'all! Do you ever have days where you feel like you've just hit a wall? You can't focus, or think straight for beans? That's how I feel today, so bear with me! I've been meaning to post this recipe for weeks and just keep forgetting. Some of you may remember this from my Guest Post over at The County Cook a few months back, I had so much fun with this post. It was my first ever Guest Post and it was a brand new, never been made or posted before original recipe! And now I want to re-share this recipe with y'all! If you're unfamiliar with Biscotti, they are a twice-baked cake/cookie originating in the Italian city of Prato. The cakes are generally large almond biscuits, made dry and crunchy through cutting the loaf of dough while still hot and fresh from baking in the oven. And let me tell you, they are amazing!! 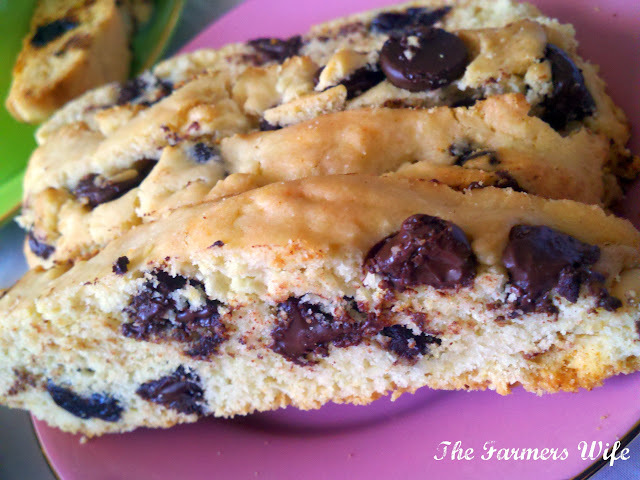 I remember the first time I had biscotti, and they were this chocolate creation a friend of mine was serving at a party and I fell in love. Now y'all know I'm just a wee bit obsessed with coffee (ok... more than a wee bit...) and these are the PERFECT companion to your morning (or early afternoon, mid afternoon, evening cups of coffee... *disclaimer I do NOT drink THAT much coffee... Most of the time...). When you dunk these little bits of heaven into your coffee, tea or whatever they soften up a bit and the added flavor is just amazing! I highly recommend giving these a try if you're a die hard coffee freak like I am, you really won't be disappointed! Preheat the oven to 375° F, and line a cookie sheet with parchment or wax paper. In a large bowl, whisk together flour and baking powder. Add in the Cherries, Dark and White chocolate and toss in the flour mixture (this will prevent them from sinking to the bottom of the dough). In a medium bowl whisk together eggs, oil, sugar and almond extract. Add to the flour mixture and mix well. The dough will be stiff, and sticky, you may want to use your hands. Once mixed, divide the dough in half, and form into 2 log's on the cookie sheet the length of the pan, flattened slightly. Bake the logs for 25-30 minutes until golden and firm. Let cool about 30 minutes, then slice with a serrated knife into 1/4-1/2 inch thick slices. Arrange on cookie sheets and bake again for about 10 minutes, flipping halfway through to brown up the edges. Let cool and serve with coffee, tea or hot chocolate. These will keep for about a week in an airtight container. I have to say this gets 5 stars. They have an amazing flavor with the almond extract and the cherries. I personally like mine with a big cup of coffee, and they soften up a little when you dunk them and they become just delectable! 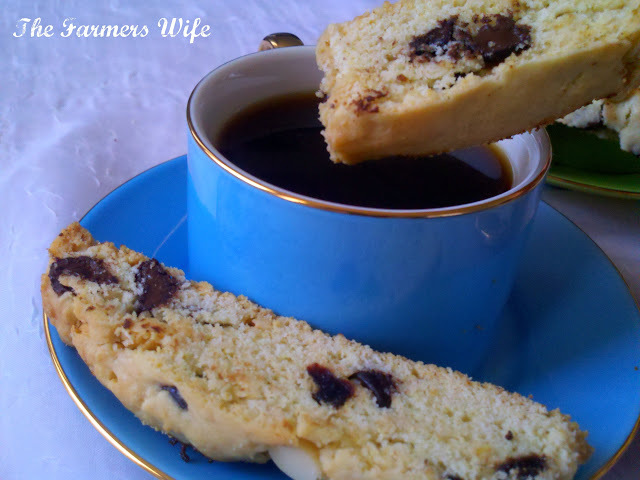 I do love biscotti, and with cherries and chocolate - who could resist! I could do with one or two of these for my morning tea break! Kim, you made such a beautiful and delicious biscotti! Wonderful post, and great pictures! Glad to see that you added some soft things to an otherwise crispy biscotti. The cherries and chocolate not only add a different type of texture but a fantastic flavor. Well done! Fantastic flavour of biscotti! Chocolate and cherry are so perfect together. I have never made biscotti before. These look great! Love the combination you came up with!